Maybe you’ve never heard of Snowbasin or Powder Mountain, two ski resorts a short drive east of Ogden, Utah. But what about the Winter Olympics (you know, this year, the ones in PyeongChang)? You’ve heard of them, right? Back in 2002, Snowbasin hosted the downhill, super-G, and combined events for the Salt Lake City games. 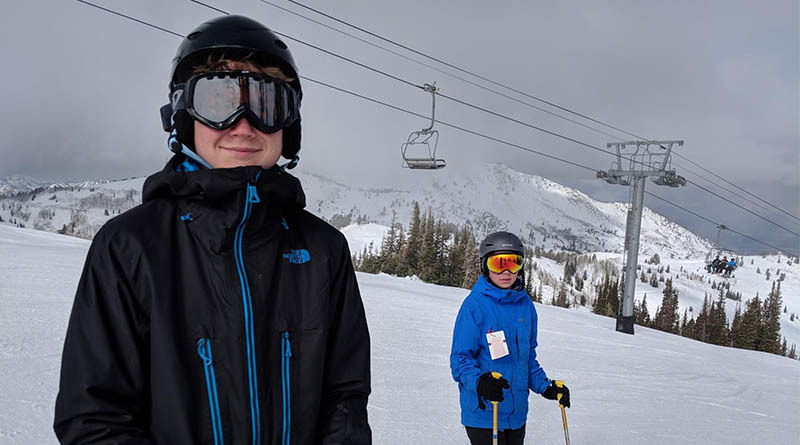 And Powder’s claim to fame: It’s the largest ski resort in Utah, in terms of skiable acres (8,464) and the eighth largest ski resort in America, when measured by slope length. Powder and Snowbasin are, as my dad likes to say, two peas in a pod because they’re in the same valley. But they are very different peas. One is more corporate, the other counter-culture. They look different and feel different, but they have the same sublime snow, plus Utah’s legendary outdoorsy vibe. If you can find them, that is. It’s a challenge for these resorts to compete with the flashier Park City area mountains. They’re not as close to Salt Lake City and they don’t have the million-dollar marketing budgets. This lack of hype could lead you to believe you’re in the middle of nowhere, when, in fact, you’re somewhere really special. Which pretty much describes how I felt when we checked into our little place overlooking the Pineview Reservoir in Huntsville, Utah, about halfway between Snowbasin and Powder Mountain. It was surrounded by snowcapped mountains and seemed almost desolate, even though we were here at the height of ski season. You can’t quite see Powder Mountain — or “PowMow” as the locals call it — from our place. The resort is accessible from nearby Eden by a narrow, winding road. A sign ominously warns motorists that chains are “required” during ski season, but on the day we drove up to PowMow, the roads were completely clear. By the way, it’s true that this has been one of the worst ski seasons in memory as far as snow goes. No matter where we’ve visited — Colorado’s Wolf Creek, Purgatory, Crested Butte or Eldora — the snow has been uniformly disappointing. I wondered what a place that modestly calls itself Powder Mountain might be able to offer. More than I thought, it turns out. Powder Mountain is enormous, but it also keeps its snow like a reservoir holds water. It breaks ski resort traditions in many ways. First, you drive up to the base and then ski down, like Snowshoe Mountain in West Virginia. It also emphasizes quality over quantity, limiting lift ticket sales to 1,500 per day. This, the resort promises, ensures the lowest skier density of any major ski resort in North America. And here’s something else you normally won’t find at an American ski resort: A snowcat, the kind used for grooming slopes, utilized instead to transport skiers from one ridge to another. I didn’t have to imagine what this place would be like with good snow, because Powder Mountain had the best snow I’ve skied on all year. That’s what you get when you create a ski resort at the top of the Wasatch Mountain Range. Lots and lots of snow that sticks to the ground when everyone else has gone to the beach. On the fixed-grip chairlift, a guy from Houston told us about the last powder day at PowMow, and I could swear those were tears in his eyes. Here, the snow is something like a religion. Snowbasin may share a valley with PowMow, but in many ways, feels like it’s on another continent. Sure, the snow is still great (I base this on two visits, one in February and the other in late March). But the slopes here are a little more serious. There are two Olympic downhill runs. Have you ever stood at the top of a downhill run? Just take the Allen Peak Tram to the top and take a peek down Grizzly, the start of the men’s downhill course. It starts with a wall of snow that you basically plunge down, reaching speeds of 70 miles per hour. Even the slightest miscalculation can send you careening off the slope and to to the hospital. I made careful turns down that black-diamond slope until I reached the bottom. Speaking of Olympics, Salt Lake City is making a bid for the 2030 games, which has the folks at Snowbasin excited. They can already envision the athletes coming back to the top of Allen Peak and competing again. That would be something. Snowbasin is known for two other things: First, its base lodge is among the nicest in the west. It looks more like one of those upscale ranches in Wyoming than a ski lodge, with soaring ceilings, 360-degree fireplaces and gourmet food. And second — and this may come as a surprise — it offers some of the longest and most family-friendly runs I’ve ever been on. Try Elk Ridge, accessible from the Strawberry Gondola, for some pure carving pleasure. Ah, and the views! Both Snowbasin and Powder Mountain have incredible vistas of the reservoir or of Ogden and Salt Lake City. But on a clear day, from the top of the Allen Peak, it’s said that you can see all the way to Colorado, Idaho, Nevada and Wyoming. I’m glad we landed here now, as the Olympics are underway. I can’t think of a more perfect time, or place. You can read more about Christopher Elliott's family travel adventures at Away Is Home.